The largest study to-date on the DNA of ancient leprosy has revealed more strains of the debilitating disease were present in Medieval Europe, than previously thought. Leprosy is one of the oldest recorded and most stigmatized diseases in human history, and these latest findings suggest an older estimated date for the disease - making it a few thousand years old. The disease was prevalent in Europe until the 16th century and is still endemic in many countries, mainly in equatorial regions between the Tropics of Cancer and Capricorn, with over 200,000 new cases reported annually. It is caused mainly by the bacterium Mycobacterium leprae, which clusters into several strain types. Only two of these were known to be present in Medieval Europe. However a new international study shows there was much more diversity in the leprosy strains circulating in Medieval Europe. This finding, based on the sequencing of 10 new ancient genomes, from M. leprae, complicates prior assumptions about the origin and spread of the disease. This includes the oldest M. leprae genome sequenced to date, which was reconstructed from human bones found in Great Chesterford, Essex, and dates between 415-545 AD. Interestingly, this strain is the same found in modern-day red squirrels and supports the hypothesis that squirrels and the squirrel fur trade were a factor in the spread of leprosy among humans in Europe during the middle-ages. Published in PLOS Pathogens, the research is co-authored by scientists from UCL, EPFL's Global Health Institute, the Max Planck Institute, the University of Tübingen, the University of Zurich, and others from Denmark, India, the Czech Republic, Hungary, Italy, and France, making it the largest study of its kind. The researchers wanted to investigate the history and origin of M. leprae further than previous studies. To do this, they looked for genetic evidence from a large number of ancient samples from leprosy throughout Europe. 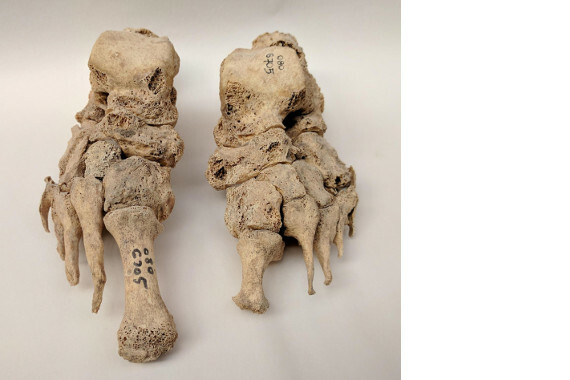 Co-author Dr Helen Donoghue, (UCL Division of Infection and Immunity), said: "For centuries there has been a question mark over where leprosy originated; most assumptions believing it started in China and the Far East. "This latest research shows all the strains of the leprosy bacterium, were in fact present in Medieval Europe, which strongly suggests leprosy originated much closer to home, possibly in the far south east of Europe, or western Asia." "Leprosy is spread via close contact between humans and needs a host to survive; therefore this study provides both scientific and historical insight into how the different strains of the disease passed between migrating populations. "We now know from this study, that different communities spread leprosy to north-west Europe, compared to those peoples who passed different strains to central and south east Europe, which may have spread along the Silk Road to China, and via the ancient trade routes to Africa," she added. The scientists examined approximately 90 individuals with skeletal deformations that were characteristic of leprosy. The individuals originated across Europe and from time periods ranging from approximately 400 AD to 1400 AD. From these samples, the researchers were able to fully reconstruct 10 new medieval M. leprae genomes, which represent almost all currently known M. leprae strain types found today at different regions, including Asia, Africa, and the Americas. Additionally, multiple strain types were often found in the same cemetery, illustrating the diversity of the leprosy strains circulating throughout the continent at the time. The abundance of ancient genomes in the current study has resulted in an older estimate for the age of M. leprae than previous studies, making it at least a few thousand years old. Co-author, Dr Andrej Benjak from the Global Health Institute at EPFL, Switzerland, said: "Leprosy disappeared from Europe, but it used to be rampant in the Middle Ages, and we know very little about why this was case. "But unlike Europe, leprosy is still a problem in many endemic countries. Studying the past spread of M. leprae might help us identify mechanisms that still contribute to the persistence of this disease around the world."